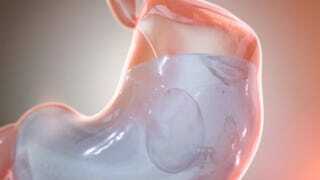 The new hot thing for losing weight is a procedure available in Europe that starts with a swallowing a pill and ends with a balloon in the gut. The Obalon balloon includes a small capsule attached to a slender tube. You simply swallow the capsule, and follow it with a glass of water. No sedation is required. Gas is used to inflate the balloon, and the tube is removed. Once in place, the balloon resides at the top of the stomach so you'll feel full sooner. Up to 3 balloons can be placed to continue to facilitate weight loss over the 12-week treatment. At the end of this period, the balloons are removed in a short endoscopic procedure. The Independent reports that during the clinical trials for Obalon, patients lost an average of 17 pounds over the three month period. As the FDA continues to crackdown on bogus (and dangerous) weight loss products, the "feel fuller, eat less" strategy is often utilized by companies trying to promote their weight loss product or plan as healthy. Obalon sounds like a slightly less invasive variation of gastric bypass: make the stomach smaller so the person can't eat as much. But despite how similar their approach is to other stuff on the weight loss market, Obalon Corporate still wants to make it clear that they're "changing how you think about weight loss." Because why else would you get it if it wasn't new and interesting? The technique has left some skeptical, however. "When they take the balloons out, what happens is the stomach hasn't shrunk," Tim Bean, a fitness expert from the United Kingdom told CBS News. "So you're left with the same size stomach, or possibly even bigger than there was beforehand." Though this concern was echoed by The Atlantic, it seems a little off. While it's true that Obalon won't permanently force you to eat less, it seems like the product is more about retraining patterns of behavior than preventing a certain amount of eating for life. And any speculation about the balloons making the stomach bigger seems to be just that – speculation. Conjecture that a patient who gets Obalon might just gain the weight back – as is the case with some patients who get gastric bypass – makes more sense. When you visit the Obalon website, there is a VERY clear disclaimer that requires you click "I understand" before proceeding that explains that the procedure is not ready for U.S. audiences. It also has not been approved by the FDA, is only for people considered seriously overweight or obese, and isn't even covered by health care programs overseas. This last point means it costs a few thousand dollars, depending on how many balloons you get placed inside of you. Depending on how many balloons you get placed inside of you...the fight for the best weight loss product gets weirder and weirder.